Developed by Nintendo. Published by Nintendo. Released November 22 2013. Available on Wii U only. At this point, appraising individual games in the Mario franchise is at once easy and daunting. Easy, because everything from the characters to the gameplay to the music has been so refined and polished over thirty years of consistent development that a certain degree of quality is guaranteed and evident almost immediately; daunting because you start to wonder what's to be said beyond a list of features and "Yup! Here's another good one!" But, yes, here's another good one. 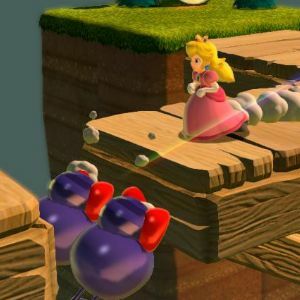 Super Mario 3D World delivers exactly the kind of experience that's kept longtime gamers coming back to Nintendo's flagship series for decades and that's won new acolytes with each successive release. It's at once a straight-shot of polished gaming challenge and a cozy drift through whimsy and nostalgia; video-game "comfort food" that's surprisingly nutritious. Structurally, it's your classic collect-a-thon platformer: Each Level (grouped into 6 initial themed Worlds) is a semi-open stretch in which three Green Stars are hidden. While one can simply progress directly to the goal of each level, a certain number of said Stars are eventually required to progress further through the game - primarily to purchase access to the Castles that serve as the final Level of each successive World. It can be easy enough to breeze ahead early on, but don't be surprised to find yourself backtracking to get previously-ignored stars once you reach the later worlds. The majority of the Stars can be found through simple exploration, but some will require (or, at least, encourage) you to use the special abilities of specific player characters to attain. 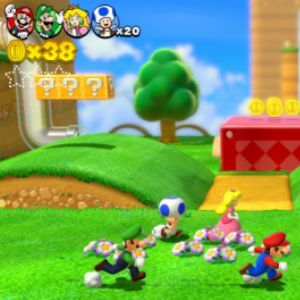 In the single-player mode, you can choose between Mario (the "balanced" character) Luigi (jumps higher) Princess Peach (floats short distances) or Toad (runs faster) at the start of each level. In the multiplayer mode, between two and four players progress through the levels at the same time, each taking control of a different character. Other Stars, meanwhile, are more easily gained by using specific power-ups. The customary Mushroom is, of course, present, as is the Fire Flower and the invincibility Star. The Mega Mushroom, which turns you into a screen-filling, scenery smashing giant, appears in 3D for the first time; while the nostalgic Tanooki and Boomerang suits both make welcome returns. The newly introduced Cherries, powerups that produce clones of your character, are fun to play with but only feature in a small number of levels built specifically around their use. Same goes for the Canon-Block Hats that bring new meaning to the term "Headcannon." The new showpiece, though, is the Super Bell, which wraps your character in a fuzzy Cat Costume (which, really, would probably be enough just in itself) while granting wall-climbing powers and a claw attack, along with a death-from-above jump and dive attack that actually takes a little getting used to - you can't cancel mid-dive, and you may launch yourself directly into plenty of bottomless pits while learning to gauge the distance. Once you've got it, though, the game offers few more viscerally-satisfying moments than dive-bombing enemies and bosses into submission. Oh, and you make little "meow" noises that manage to land on the "charming" side of surrealism. That's a lot of variety, so it's doubly impressive that it all works so well via a minimalist control scheme (the classic two-button run/attack, jump arrangement from the NES games) that allows the use of the many different controller options available to the WiiU. Some of that minimalism extends to the interface: The animation hides it exceptionally well, but your movements in three-dimensional space are actually locked to an eight-directional axis like on the Nintendo64 rather than true analog free-motion. This can be a bit of an adjustment at first, but it also has its advantages i.e. moving in a straight-line when you need to is much less of a thumb-strain than it was in Galaxy. That kind of variety goes a long way to keeping things fresh, a must considering that you'll often wind up playing a level multiple times to collect all the Stars, making mental notes of lengthy jumps and bosses that may require specific powerups to effectively beat. I'm still not 100% convinced that the multiplayer actually "adds" much to the actual nuts-and-bolts gameplay. There's not much room (or need) for strategizing when it comes to level-completion, and since the game will essentially transport stragglers to wherever the furthest-ahead player has gone at a given time it still feels like its real practical use is to let one continue to actually play the game while also letting friends/siblings/etc feel like they're "helping." On the other hand, while it might not have much "benefit" gameplay-wise, moments when all four characters are onscreen using different power-ups and attacks all at once generate a kind of infectiously manic joy that serves to remind you that the best games are the ones that are as fun to play with as they are to play through. If only that kind of bordering-on-anarchic variety in gameplay extended to the game's level-design, story or overall aesthetic. Yes, at this point, the Mario series is so singularly "itself" that entries are best described in reference to their own legacy: 3D World is the console-version of 3D Land, (which was in turn a mash-up of Mario64's gameplay and Super Mario Bros 3's costume power-up system) plus New SMB Wii's local multiplayer and SMB 2's character roster. Fine. All well and good. But does that really mean that the "house style" for the character models, textures, sound and music that's been the series' default since New SMB on the DS seven years ago - lovely as it looks in HD, granted - couldn't have stood more of shakeup by now? It almost feels curmudgeonly to call this over-reliance on the familiar a flaw, when it's still so well done strictly on its own merits. It's all so pretty and fun to play, and there are agreeable new additions like a level set in a Feudal Japanese-style castle, racing levels where you ride a giant dinosaur named Plessie down rivers (where multiplayer-teamwork actually does serve a purpose!) and surprisingly-challenging levels where you steer jumping-impaired new character Captain Toad through mazes by changing your perspective. And yes, some of the nostalgia-mining is genuinely delightful: the Galoombas from Super Mario World make a triumphant return, and hearing the Mario Kart theme kick up during a speed-running stage is clever. Actually, the music is one of its strongest suits; featuring gorgeous remixes of classic themes alongside new tracks like a mournful Ghost House theme that sounds like something out of an old Universal Monsters movie. Perhaps most importantly, while you don't necessarily get a plethora of wholly new sights and sounds, you do get a whole lot of game for your money. There are a lot of levels, a lot of ways to play through them, a lot of secrets to uncover, a whole bonus game (the original arcade Mario Bros reconfigured to star dueling Luigis) embedded in the title screen and... well, I won't spoil, but suffice it to say there's actually quite a bit left to see, do and unlock even after you've "beaten" the game. 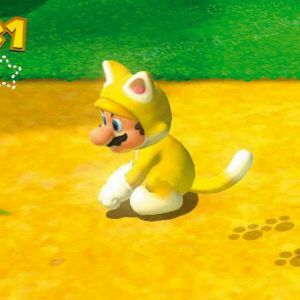 Bottom Line: Super Mario 3D World is a very good Mario game that suffers only in that the unrealized potential for it to have been a great game, period, keeps peeking in between the cracks. Fun to play for veterans and newcomers alike either as a single-player challenge or frenetic multiplayer party-brawl; and a definite must for current and prospective WiiU owners. Recommendation: Buy it if you love that little plumber, and enjoy the new toys, but don't expect your mind to be blown.